via the combination headset/microphone jack. various instruments, mixers, or even another mp3 player. to a wav file for uploading to the cloud. Gain control is provided to boost weak sources. to match various cpu speeds. 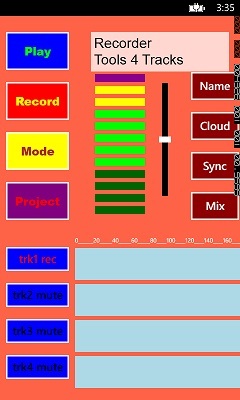 To record tap a Track button until it says trk* rec, then tap RECORD. Tapping STOP will stop recording and return to zero. Each Track button can be set to MUTE, PLAY, or REC (Record). Except PLAY is skipped if the track has not been recorded yet. Note that REC is skipped during recording to allow toggleing PLAY/MUTE. The waveform image can be moved around the screen to see it all. but the recording will continue past that. It is recommended to tap PROJECT first (to initialize all variables). If you have named the project, it will then be displayed. If not, tap NAME and OK, then tap the text box at the top of the screen. Now you can type in your projects name, and tap SAVE. Tapping PROJECT repeatedly will round robin through all 10 projects. IMPORTANT: If you hear a delay between tracks - Adjust SYNC! All digital signal processors have a latency, or delay (google latency). and software efficiency, plus apps timeshare the processor. the phones cpu speed (and background processes). so you need to set it up just once. If you have a slower phone, first try setting SYNC to 3. 1. Normal Mode - Can record any 1 track while listening to other tracks. The meter displays input level. Input gain can be adjusted with the fader next to the meter. Other tracks can be muted if desired. Drag and drop waveform images as desired. 2. Monitor Mode - Listen to Input Source while checking level via meter. Always plug in a headset to prevent feedback. Automatic mute occurs when signal level is too high. 3. Mixdown Mode - Records the 4 tracks to a wav file. 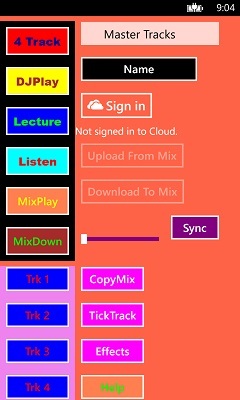 Adjust the level of each track after tapping MIX. Drag and drop the Mix Faders wherever you like. Tap MIXDOWN to begin recording the hidden file. At the end of the song, tap STOP and you are ready to upload. Tap CLOUD to go to the Upload Page. The file size can be up to 10 megabytes. Uploading usually takes about a minute, so be patient. 4. Bounce Mode - Records 2 to 4 tracks to a hidden file. Tap BOUNCE to begin recording the hidden file. At the end of the song, tap STOP, then set a track to REC mode. Finally, tap SAVE and the REC Track will be overwritten. To cancel, before SAVE tap MODE instead. 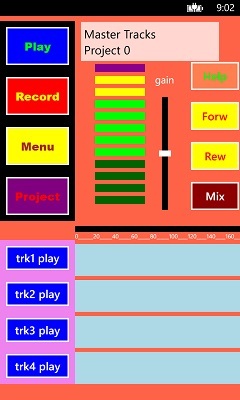 Multi-Track Recorder, DJ Mixer, Lecture Recorder. 4 Track recorder for songwriters with sound on sound. DJ mixer with fade in/out, effects, and speed control. with an accessory box (like the Tascam iXZ). with waveform Images beside them. The Images can be dragged and dropped across the screen. The Meter indicates Record Volume and the vertical Slider adjusts Record Volume. (Phone Airplane Mode recommended, except for Up/Downloads). Pressing the PLAY button will play all Tracks that are in Play Mode. The MODE buttons can toggle Play to Mute and back as desired. Note that non-existent Tracks cannot be changed to Play and will stay in Mute. and the Faders can be dragged and dropped across the screen. and the RECORD button is used to punch in and out of recording. playback or recording and Return to Zero. which selects the next project and round robins through all projects. or recording, and pressing it again will resume. which allows multiple options to be set on Page 2.
and can be pressed when Stopped or during Playback. at the new Position Mark or freeze it until PLAY pressed. Pressing the REW button is similar to FORW except in reverse. so use the PAUSE button and FORW+REW to maintain position. initializes the hidden Mix Track. The Tracks can then be Mixed Down to create a multi-track song. Start the Mix Down by pressing MIXDWN. Tap MIX to adjust Volumes as the Tracks play. to hear the hidden Mix Track you just created. Once satisfied, you can Upload the hidden Mix Track to the Cloud. PAGE 2 to COPYMIX to a single track to free up the extra tracks. Tick Tracks can be created to help you maintain constant rhythm. The Beats Per Minute is set by the horizontal slider. The Measure Time is set based on which track you select. one after another (instead of simultaneously) for long recordings up to 100 minutes. and set Gain to keep the Meter near the middle of its range. and use the Track Mode buttons to skip from track to track. FORW and REW will quickly advance the position in the tracks. even though the image only shows 20 minutes. Position of a second track while the first track is playing. and faded in with the MIX controls. Speed up or slow down the music with the slider control. Effects can be played and new effects recorded. Note that effect record only lasts 1/2 second, so be quick. repeating the DOWNLOAD and COPYMIX for other songs to the other tracks. Advance to the next Project after 4 tracks to download more songs. before Downloading (use encoder/converter software on a PC). To maximize efficiency, recode tracks to 16000Hz Mono PCM (WAV). by another source using the phones microphone, or an audio interface box. the Position Mark to skip to the desired start point for each song. Note: USB audio devices (e.g. microphones) do not work on Windows Phones.